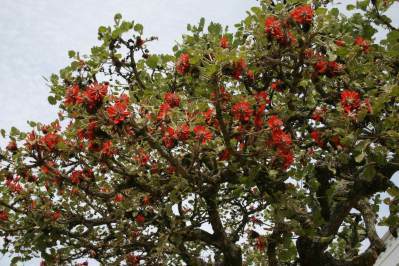 This most unusual of the South African Erythrina species is an interesting tree with major bird-attracting potential. Erythrina latissima is an attractive, small to medium-sized tree, 5 to 8 m tall. The trunk and branches, which are woolly to begin with, have prominent thorns and thick, corky bark. Unlike the other South African species of Erythrina, the large leaves of E. latissima are soft and velvety to begin with, becoming grey-green and leathery as they mature. The compact inflorescences are borne on stout peduncles in early spring before the new leaves appear. The flowers are scarlet with a grey, woolly calyx. The seed pod, up to 300 mm long, has constrictions between the bright red seeds. Each seed is marked with a black dot. The tree is fairly slow growing, taking 20 to 30 years to form a reasonable canopy and will live for over a hundred years. Older trees however, do have a tendency to fall over. 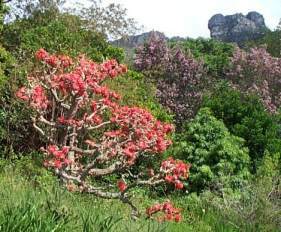 According to the Red List of South African Plants, Erythrina latissima is widespread and common and is not threatened, although its preferred habitat is under threat from commercial tree farming. It has a status of Least Concern (LC). This species occurs along the east coast of southern Africa from the Eastern Cape to Zimbabwe in frost-free, wooded grasslands and scrub forest. It will withstand light frost but will grow faster in frost-free areas. The name Erythrina is derived from the Greek word erythros meaning red, while latissima is Latin meaning extensive or very broad, referring to the size of the leaflets. The genus Erythrina occurs in the tropics and subtropics of the Old and New World. There are about 170 species in the genus, one of the most widely grown being E. crista-galli, a Brazilian species. In Asia , E. indica is planted to provide shade. 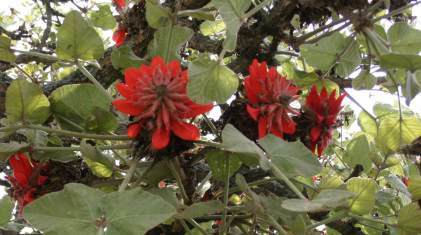 Other attractive South African Erythrina species described on this website are: E. caffra, E. lysistemon, E. humeana, E. acanthocarpa and E. zeyheri. When the coral trees are in flower, the red blossoms attract a large number of birds for the copious nectar that they produce. In full bloom, the trees attract sunbirds, weavers, starlings and bulbuls. When the tree or branch is dead, the soft heartwood is easily hollowed out to provide nests for barbets and woodpeckers. The orange-red seeds, commonly known as lucky beans, are threaded on to string to make decorative necklaces, which some believe will ward off evil spirits. The bark is burned and then pounded into a powder which is used to dress wounds. Truncheons of the larger erythrinas are used as fence poles which in time take root, creating a living fence. In large gardens, a single plant or group of Erythrina latissima creates a spectacular accent point which is of interest throughout the year. Take care not to plant the trees near buildings or paving as the root system is very invasive and will create problems. Plants such as Plectranthus spp. Scadoxus multiflorus and S. puniceus, and Clivia miniata do well under these trees. E. latissima is easily grown from large truncheons or seed. Truncheons are made from branches which are more than two years old and should not be thinner than 100 mm. It seems that the bigger the truncheon, the easier it roots. The trimmed branches are left to dry for 2 or 3 days before planting them in the ground. A layer of river sand in the base of the hole will enhance rooting. The truncheons must not be over-watered and should root in 2-3 months. It is best to soak the seed in hot water overnight to soften the hard seed coat in preparation for sowing. The soaked seeds are then placed in seed trays containing sharp river sand or composted bark. Cover the seed with a layer of whatever medium is used, and water. Germination should begin in 5-8 weeks. When the seedlings have made a swollen base, they can be transplanted into pots or plastic bags. Under ideal conditions, once established, the young plants should put on between 200-600 mm growth per year. 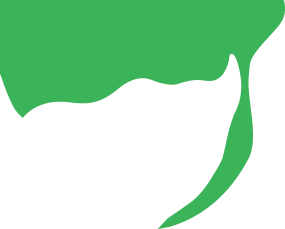 Stem borer is a major problem when the plants are young and regular spraying with a systemic insecticide is essential while the plants are young. As the tree grows and matures, it becomes less of a problem. Menninger, E.A. 1962. Flowering trees of the world. Heathside Press , New York. Zimmer, G.F. 1963. A popular dictionary of botanical terms. 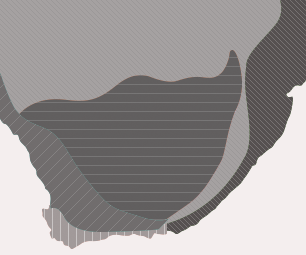 Routledge & Paul, London.